Vanessa grew up in the village of Ver-sur-Mer a mile or so inland from where Gold Beach and Juno Beach meet. Youngest of four, she's lived on the Liberation Coast all her life and known many people who witnessed D Day - Jour J as they call it in France - and who survived the ferocious Battle of Normandy that went on for several weeks afterwards. Normandy paid a high price for Europe's liberation. 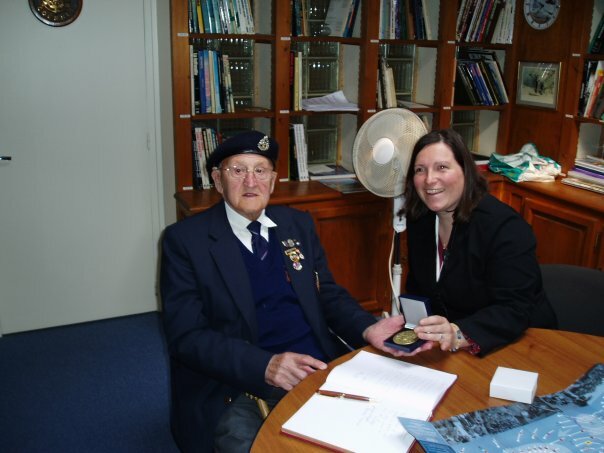 One special memory for Vanessa is presenting a medal on behalf of the town, Arromanches-les-Bains, to a 90 year old British veteran of D Day who had returned for the first time with his sons. Vanessa studied tourism at Angers University and qualified as a National Guide. She is an expert on the D Day beaches though also takes parties on tours all over Normandy from the ancient city of Caen to the tiny isle of Mont Saint Michel. Normandy has a rich history and beautiful countryside. The region is famed for its cheese and butter, cider and calvados, its reputation for delicious beef and seafood. Vanessa widens our horizons by introducing our visitors to the story and culture of Normandy. Not far inland from the landing beaches is the smallest city in France, Bayeux, a gem with its ancient cathedral, half-timbered houses, street market and festival week, and home of the 1000 year old tapestry depicting William the Conqueror's 1066 invasion of England. Normandy is a treasure chest of castles and ancient villages and towns. The city of Caen has a castle and two cathedrals - one with William's tomb. Normandy stretches some distance east of the River Seine and its closeness to Paris made it a popular resort. Monet created a beautiful garden at his home in Giverny and Flaubert set much of Madame Bovary, widely regarded as the first modern novel, around Rouen and Le Havre. Deauville with its racecourse and golf clubs is very much Paris-sur-Mer. Vanessa has an enviable knowledge of all these places and there's always something new for those who take the time to spend a few days in Normandy. She studied languages at Caen University then spent a year in Coleraine in Northern Ireland and also three months in Spain. She speaks fluent English and Spanish, not to mention some Portuguese and Arabic. She started guiding after university. One of her first jobs was chaperoning staff and guests for the American Embassy in Paris when the ceremony took place to commemorate the 60th anniversary of D Day in 2004. She then became a guide at the Caen Memorial Museum - which remembers those killed in the devastating bombing raid on Caen before the British finally drove the German Army from the city. Thoughtful displays in the museum cover everything from D Day to the Nobel Peace Prize. Vanessa began taking groups to the invasion beaches as part of her job at the museum. After about two years gaining experience she joined the staff of the Landings Museum at the pretty seaside town of Arromanches-les-Bains - where the western British landing took place and where the remains of the Mulberry Harbour still break the waves. The museum overlooks the beach and several lumps of Mulberry Harbour on the sands. 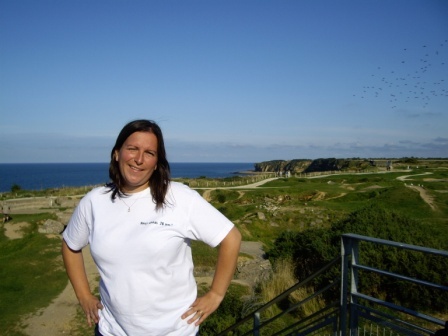 Having gained a great deal of experience and knowledge Vanessa felt ready to create her own tour service and last year she launched Normandy Panorama. 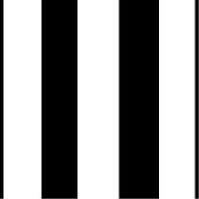 Have a look at our pages about overnights and Vanessa's website for Normandy Panorama. We chose Synergy Aviation as our original air partner because of their professional operating standards and safety reputation. Synergy were also founded by a former British Airways senior training captain who imparted his high standards to a very fine team of young pilots. Lots of pictures of their aircraft on the Easy Aircraft Guide page reached via the Easy Sky Guide. Among their regular passengers are the boards of internationally known companies. One American was so impressed by Glenn's team that he presented them with a large and splendid model of a Lancaster bomber - which stands on the table in the Operations Room. Synergy Aviation run by Captain Glenn Heavens - see photo above - operate from Fairoaks Airfield in Surrey. Glenn has modernised his aircraft fleet and we no longer fly in Seneca's. We found them very comfortable for a couple or a young family but they simply lacked enough room for more than three adults. These days Glenn takes us over to Normandy in a very roomy PA 31 Chieftain which can take a group of five with a sky guide - or the even roomier King Air which can take a group of seven with a sky guide. Both these aircraft have large windows for spotting famous places on the ground and taking those treasured photos. The King Air is very fast and its cabin very quiet. 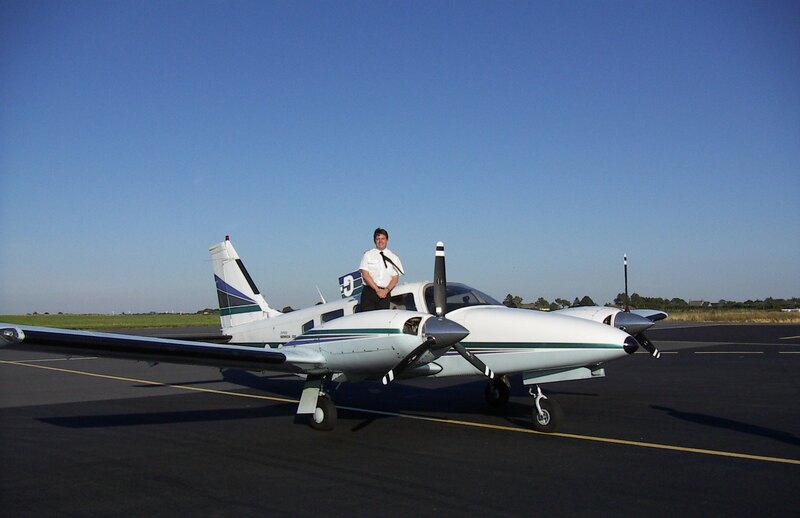 Sky Leisure has been flying charters and training pilots for 25 years. 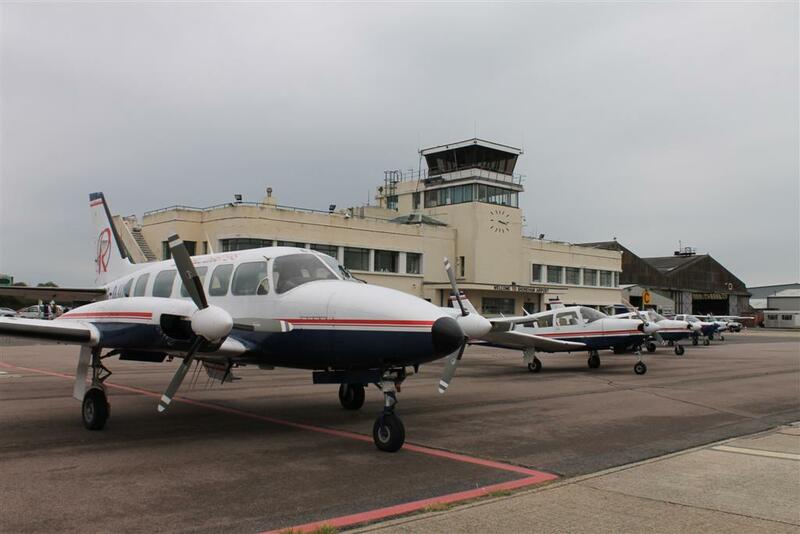 Based at Shoreham by Sea - Brighton's Airport - their home base is beside the English Channel. This brings our take off point much closer to Normandy. Although the journey from London to the airfield is longer, travel costs from London to the coast become the price of a car drive or train ticket. That allows us quite of lot flexibility. We can offer to traditional tour or extend the flying portion of the tour - close to the D Day beaches are Mont Saint Michel and Falaise Gap. We can offer tours which include overnights at surprisingly reasonable costs. Sky Leisure have a very friendly professional team. You can learn to fly, both as a private pilot or a commercial pilot, and they offer trial lessons. 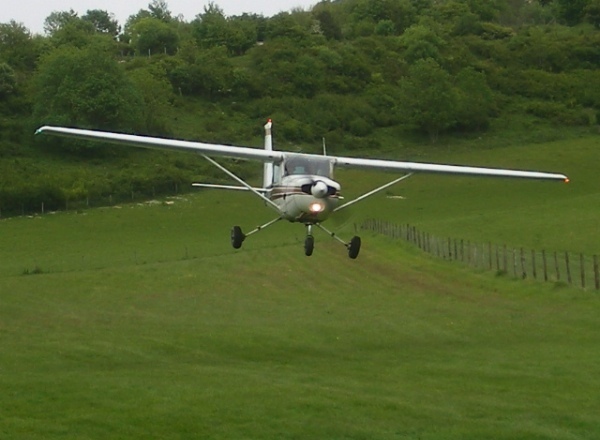 About seven years ago Sky Leisure founded a flying club with both students and instructors as members which gives a great atmosphere to their flying school. 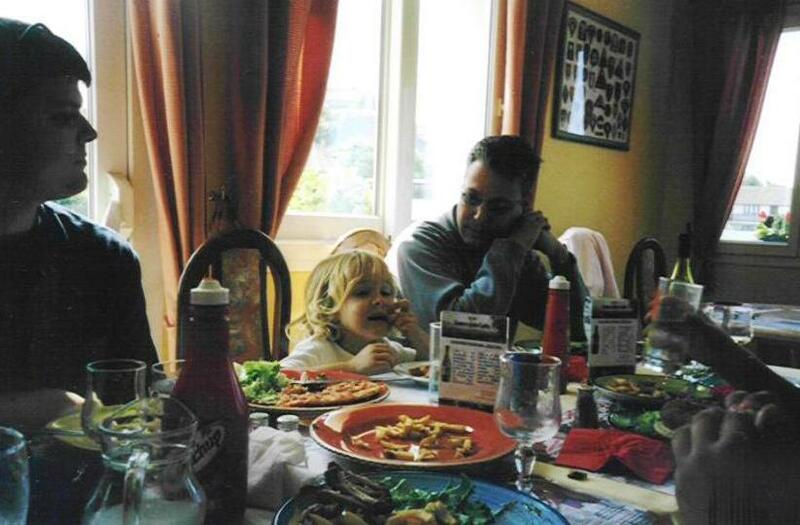 The club Christmas meal is organised by a member - who owns a renowned local inn. Lots more information about Sky Leisure and their flying school on their website - just click the photo below of the ladies. Sky Leisure's Chieftain keeping historic company - left side photo the tail of a rare Luftwaffe Me 109 just shows while two RAF Hurricane fighters occupy the top of the picture. Seventy years ago these aircraft fought over Shoreham during the Battle of Britain. Bill Pritchard finally reached that dreaded age when the Civil Aviation Authority insist that even the best pilots may no longer fly commercially. Based at the former RAF fighter station, Biggin Hill Airfield in Kent, Mayfair Dove Aviation operated a splendid classic aircraft retired from the Royal Flight which on many royal visits, sometimes piloted by the Duke of Edinburgh, safely flew members of the Royal Family. 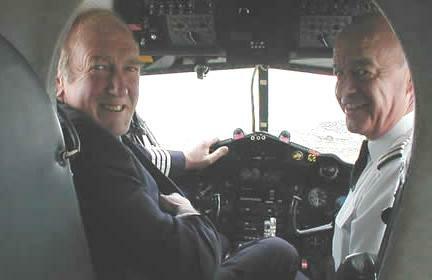 Our pilots, Bill Pritchard and Dave Frost were former British Airways trans-oceanic captains. They logged tens of thousands of hours flying jet airliners all over the World - Comets and 707s, Tridents and 747/400 Jumbos - and trained many BA pilots how to fly these huge aircraft on long haul routes. The Mayfair Dove began life as a Royal Air Force VIP aircraft - the sturdier RAF version called a Devon - based in Germany and then at Supreme Allied Headquarters Europe where her task was to fly Field Marshal Montgomery, Deputy Commander Allied Forces Europe and later his successor, General Sir Richard Gale who had commanded the British 6th Airborne Division on D Day. She is a veteran of two wars - the 1965 war between India and Pakistan and the Vietnam War - having been the Air Attaché's aircraft in both countries, first based at Karachi then later on Saigon. By one of those quirks of fate Adrian Hill ( see our guides ) experienced both these wars and often flew in her when she was based in Saigon - he well remembers watching F4s putting in air strikes not far below her among the Central Highlands and the Air Attaché, Group Captain Mickey Swiney, normally a supersonic fighter pilot, bringing her on finals by side-slipping through the aerial queue - often scores of circling aircraft - and softly flaring straight onto the runway at Tan Son Nhut to incredulous vocal approval from the young American air traffic controllers. Mickey Swiney flew her all over Vietnam, Cambodia and Laos. 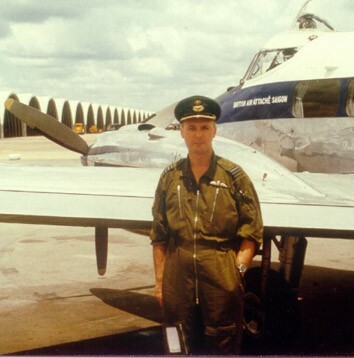 He took her into Dalat, probably the trickiest airfield in South Vietnam, in those days an earth strip perched on the summit of a 5,000 feet high mountain, sometimes with the VC lurking among the thick forests along the approach. Eventually she went home and joined the VIP squadron at RAF Northolt. Finally she retired from RAF service and became a small civil airliner. Mayfair Dove Company owned her from 1993 - 2010 when Bill retired. She's found a new home but without Bill who has a house in Salcombe - and a boat - it's just not the same. The Mayfair Dove is a capable lady. She was built to demanding RAF specifications. The photo at right shows her low over the Bay of Cambodia. 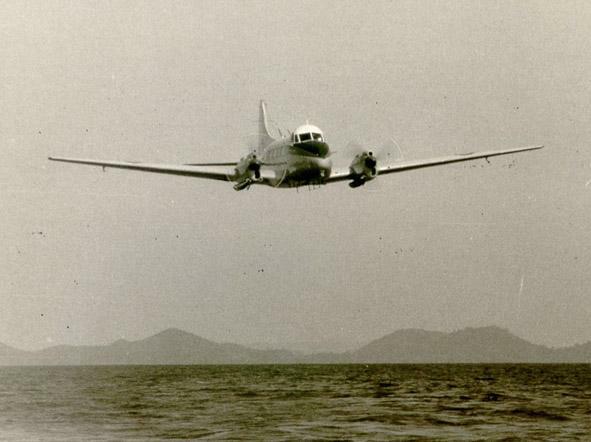 Have a look at the 207 Squadron RAF Association's website pages on Devon VP962 - now the Mayfair Dove - and the Australian Clyde North Aeronautical Preservation Group's pages on the DH Devon/Dove. Until the Britten-Norman Islander took to the air the DH Dove was the most popular British airliner ever built with some 550 sold all over the World and quite a number still flying. Vanessa with 90 years old British veteran. Easily reached from London and home counties - the station sits in the top left corner of the photo and the motorway is just a couple of hundred yards too far left to make the photo -today Shoreham is Brighton City Airport. ( Brighton is famed as London by the Sea. )The River Adur flows beside a long spit forming Shoreham Harbour before reaching the Channel. Shoreham Airport dates from 1910 and on the 4 July 1911 the first recorded air cargo flight hopped across to near-by Hove delivering a box of Osram light bulbs. The airfield became busy quickly as the First World War approached with some famous names making aircraft. During the war Shoreham trained pilots. After the Armistice the fledgling Royal Canadian Air Force was based on the field. For a few years there was no flying but in 1925 the airfield opened again for flying and manufacturing. The splendid Art-Deco Terminal dates from 1936 and regarded as a gem, still welcomes passengers to this day. World War Two found Shoreham as the base for 277 Air Sea Rescue Squadron - who picked up some 600 aircrew from the Channel. The airfield was bombed several times, during the Battle of Britain in 1940 and later. Fighters flew from Shoreham for dog-fights over Dieppe in August 1942 and patrolling above the D Day invasion beaches on the 6 June 1944. There's a D Day landing craft in Shoreham Harbour which we show passengers shortly after take off. 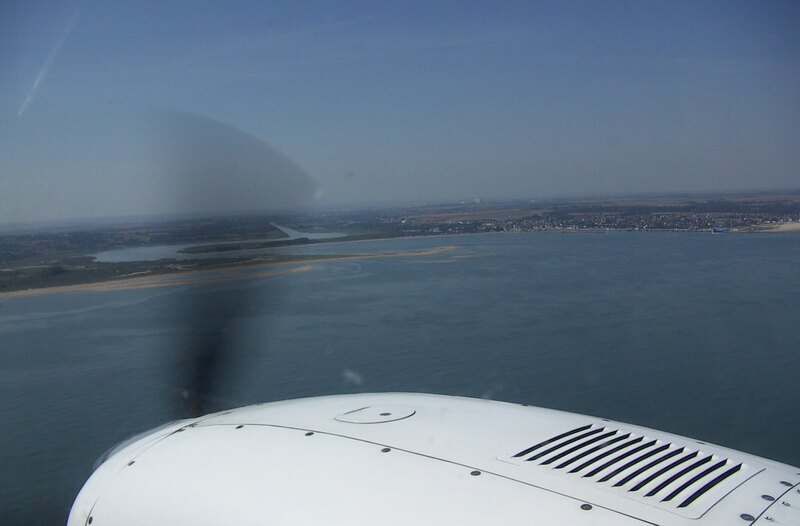 Because Shoreham is on the coast our start point for Normandy flights is much closer to the D Day beaches. This greatly reduces the flying time and thereby cost. Sky Leisure's fleet and the splendid Art-Decor Terminal. The row of big windows at left are Sky Leisure's office with a wonderful view across the airfield to Lancing College and the South Downs. Mayfair Dove has a sister in Germany - the LTU Dove based at Munchengladbach - have a look at STOP PRESS and the Swiss Alps pages on our website. As far as we know, they are the only Doves still flying as airliners in European skies. 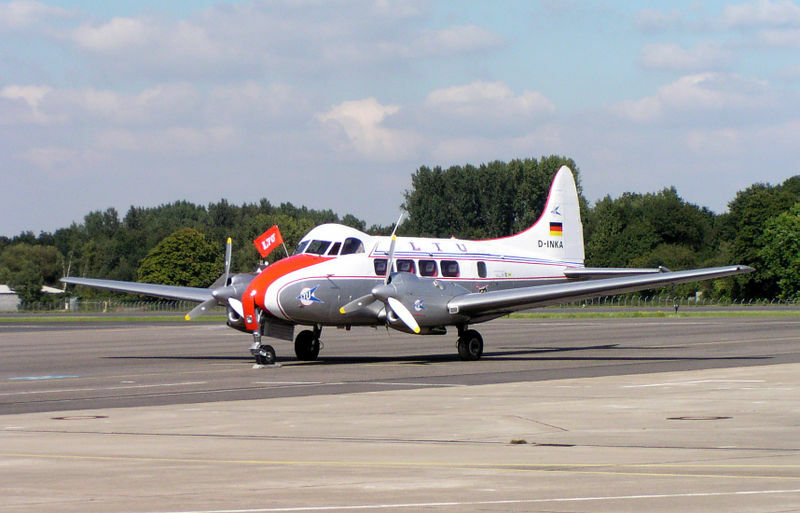 The LTU Dove's website at www.ltu-classic.de has some wonderful touches and you can book a flight via the website. We spend much time on the Continent making friends and building partnerships. 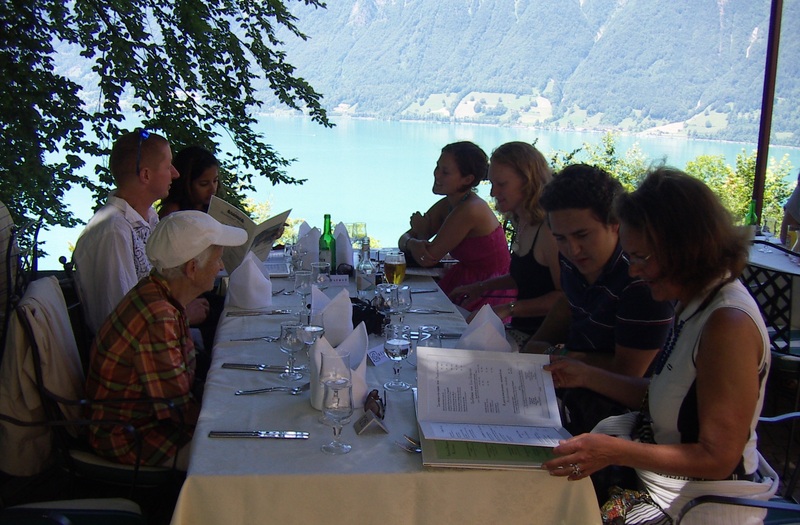 Whether in France, Germany, Switzerland or other countries, nowadays most local tourist authorities spend considerable time and effort making sure they welcome overseas visitors. We know our military history and this beautiful part of France. 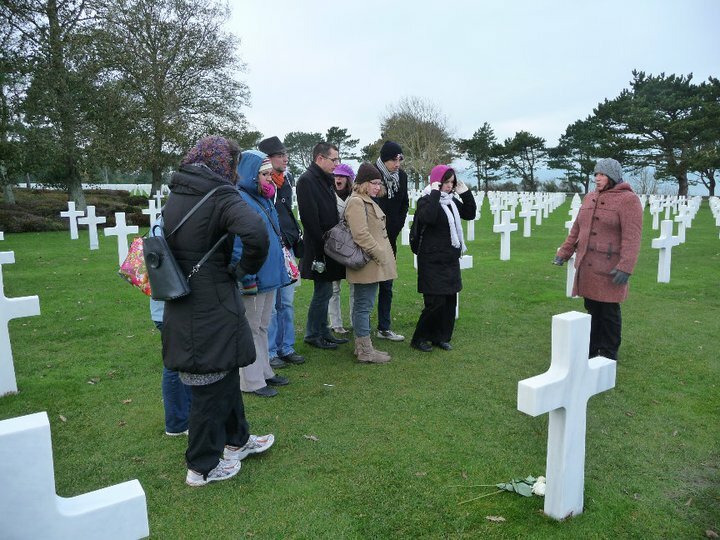 Our local colleagues bring their fascinating knowledge of the Liberation Coast, the history and customs of Normandy, thereby adding an essential ingredient to your holiday. Most speak English and our guides speak French. Some of our American visitors, one lady in particular from New York City, greatly impressed our French colleagues with her excellent Parisian accent. 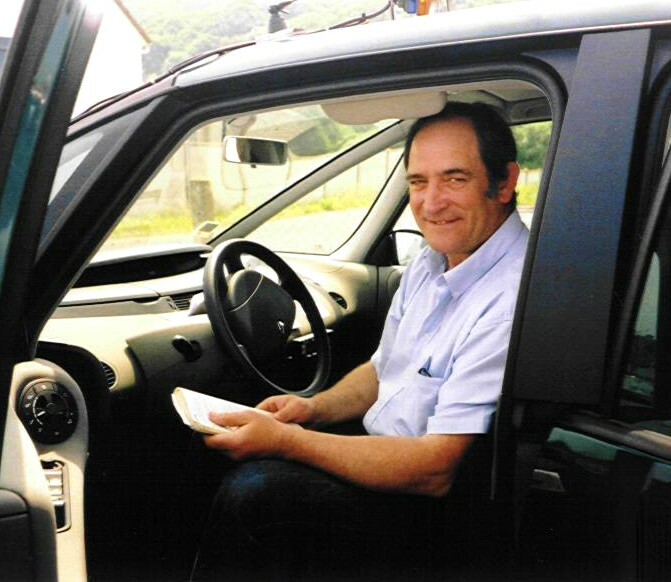 Our colleagues in France drive extremely comfortable, spacious vehicles - all fully air-conditioned. No voyage across the Channel is complete without a meal. JJ and Florence Gaffié make our visitors feel warmly welcome at their renowned small hotel only yards from Omaha Beach. 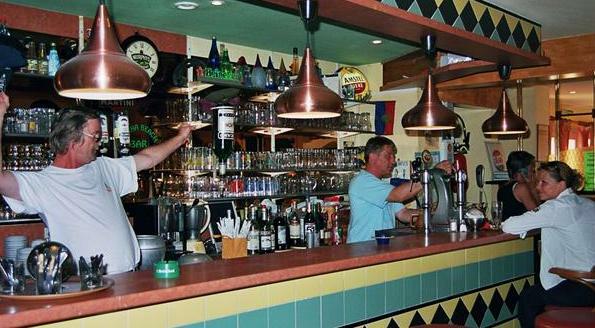 The atmosphere is jolly, the food delicious - a menu for the whole family with lots of local dishes - and served with good wine or whatever soft drink you wish. Children enjoy themselves. Please let us know in advance if you would like a cake for a birthday or special day. Adrian first went to Bern, Switzerland's fairytale capital, back in 1974 when he served at the British Embassy. He met his wife there, both their children were born in Bern, and he's been going back two or three times a year ever since. Indeed, he set a novel in the charming old city and magnificent surrounding countryside. After more than thirty years he is once more living there working on new tours and with the good fortune to enjoy a wide circle of Swiss friends. 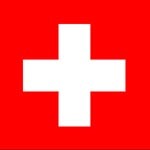 As one might expect, our Swiss colleagues are very friendly and, well, just incredibly organised.